Proteo Enterprise’s Client Portal feature is designed to empower your customers by enabling them to interact effectively and accurately with you. As a successful Haulier, it is important that you build a strong relationship with your customers increasing their confidence in your services. For any capable TMS, a client portal feature is a must and should be easy to use, informative and manage customer data well. Traditionally a customer would have to wait until their collections & deliveries where complete and all documentation was made available by the haulier to know that the task was finished and invoicing would be then presented. This process is time consuming, requires constant communication between the hauliers and their customers and fraught with complications in the event of delays, invoicing and other issues. Client Portal provides the ability for the customer and the Haulier to electronically communicate and form a part of the 2-way integration capability of the Platform. Accessible via secure login, have full visibility of their daily manifest so that they can see the status of the work. 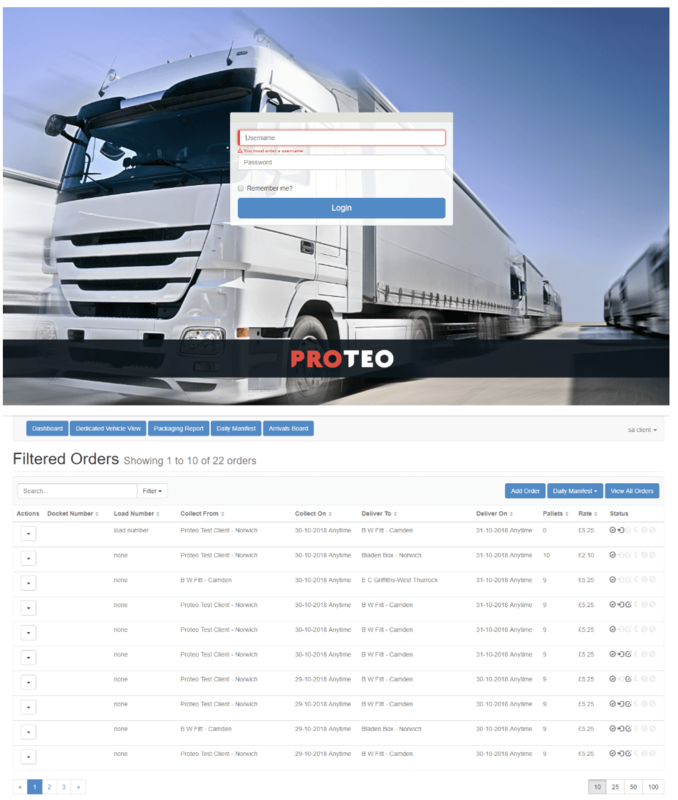 Client portal has a simple screen for adding jobs which are rated and made available in Proteo Enterprise for load planning thus enabling your customers to directly upload jobs at their end. Enable features like editing jobs to enable more useful customer interaction. This reduces the need for re-keying and offers a level of protection and auditing if the information provided is not accurate. Ability to customise views helps you customers to expose highly useful data for them to understand and track. This in turn fosters transparency and builds customers’ confidence in you, while giving them a chance to provide useful feedback to you in order to improve your customer service. All consignments added by your customers can be rated/quoted on entry using your tariffs so that the cost is known as early as possible. Your customers have access to the POD’s (and/or ePODs) and Invoices as they are added to Proteo Enterprise. They also have the ability to upload their own paperwork for their deliveries saving time and providing them the service that they need. Your customers can print Pallet Identification Labels straight from the portal ensuring that the goods are ready for your collection and tracking. Your customers can easily see the status of the PODs with an aged report showing the number outstanding by day. They can drill down into the details for these so that they can see what you want them to see, this self service functionality further reduces the calls to your teams. If your customers hire vehicles/trailers from you, you can allow them to view the tracking information for these vehicles for as long as they are assigned to that customer. This provides them with more real time information than could otherwise be gained and allows them to manage their own work more effectively. Client Portal is a TMS feature that directly improves customer service, promotes transparency, enables your customers to add and edit jobs and provides all necessary paperwork to them at their fingertips. With changing business practices and ever increasing customer expectations, tools like client portal are a must to help your business evolve accordingly and thus keep you at the forefront of this very competitive industry.